It is humid! I was all in love with how green it was and almost wanted to move there until I realized that the chilly humid air made stain take FOREVER to dry!!! I am use to dry Utah air that allows things to dry quickly. I did not factor in the extra dry time. So I was not able to seal it with the wipe-on poly and see it with the pillows and other decor. 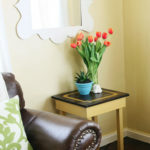 You can even see the little pieces of cardboard under the legs of the bench since it was still tacky when we brought it inside. My sister-in-law loves red ( ME TOO!) so I went shopping in her office where all the boxes of her things from the old house were. 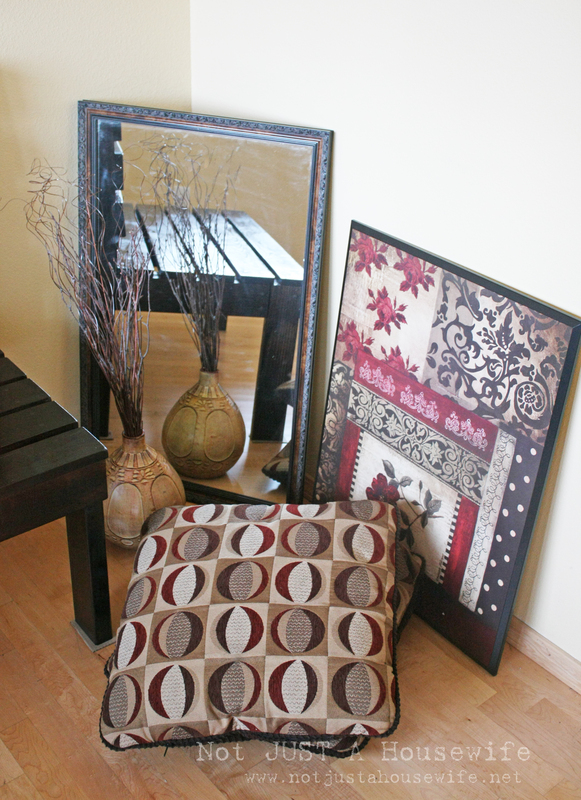 The cheapest way to decorate is to go shopping in your own home :) I grabbed some things to use in the entry. When my sister-in-law and I were shopping at antique stores, we came across an old church pew. We both loved it, but not the price tag. It was very simple in its design. 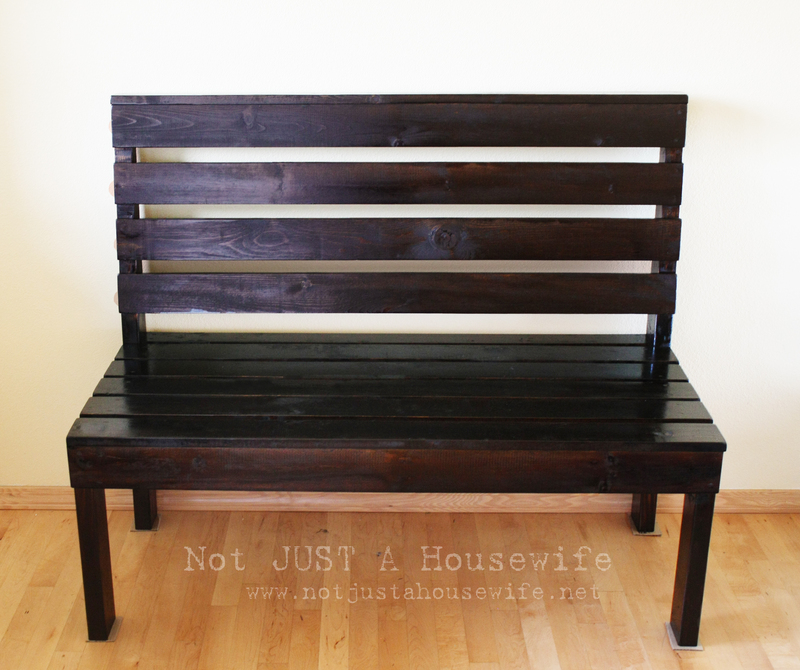 So when we decided to have me build one instead of buying one, I decided to make it similar to the antique pew we had seen. When I build things I do not follow any plans other than my own sketch. I think of what I want it to look like first and then decided how big I want it to be. Because of this, I measure and cut as I go. I do not cut all my wood at once and then assemble. I have found that even when you are following a set of professional plans, that sometimes things can be a little “off” here and there and it is better to measure along the way before cutting. I always end up with really solid pieces of furniture without gaps and other issues because of this. I also bought a quart of Minwax oil based wood stain in Walnut, wipe-on Poly (also Minwax) and foam brushes. This project was between $50 and $60 to make. Before we get started I have to give a big shout out to my Sister-in-law and Brother-in-law’s neighbors who graciously let me use not only their tools, but their garage. I took it over for a couple of days :) It was a very nice place to work. Remember when I said I don’t cut out everything ahead of time and then assemble? 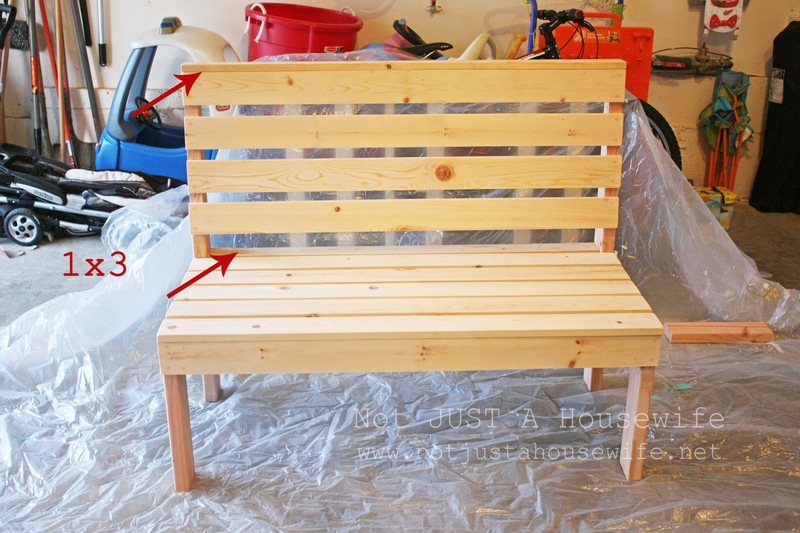 Well, I kind of broke that “rule” here at first because it made sense to cut all the slats that would become the seat and back. That is BECAUSE they all needed to be exactly the same and they were on top. So I went ahead and cut them to be 47 inches. Why not 48 since that is half of the eight feet that the board started out as? The blade when it cuts, shaves off part of the board. So you wouldn’t have an exact 48 inches anyway. Plus, the ends of 2×4’s can be rough so I cut them off. Then I cut the four legs. Two at 39 inches and the other 2 at 17 inches. The shorter ones you cut to whatever height you want the seat to be at. You can adjust that to be higher or lower depending on what you feel is comfortable. 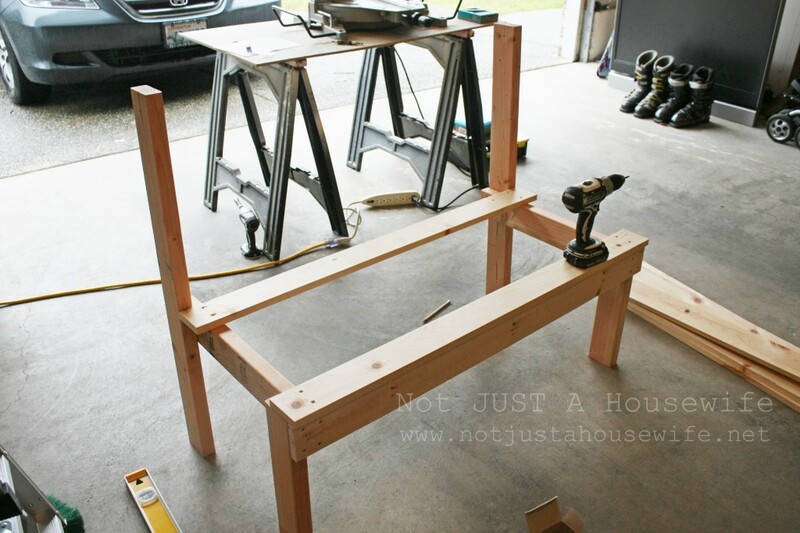 The piece that you attach them with determines the depth of the bench. 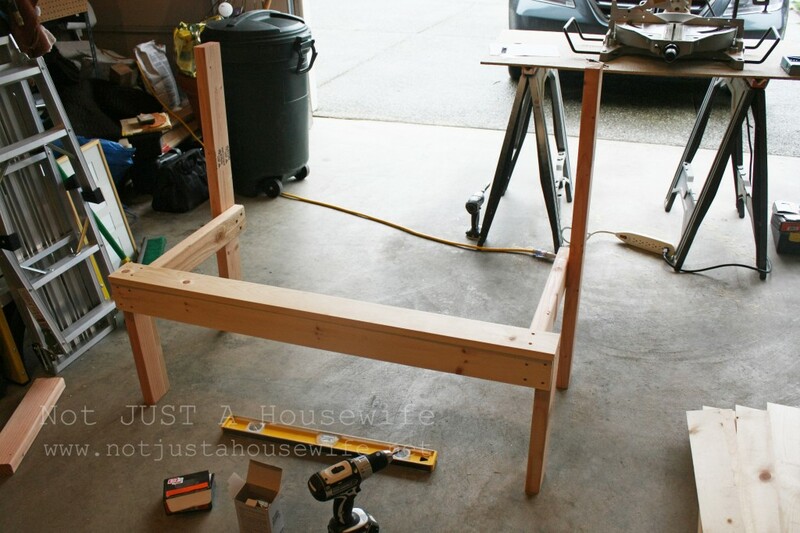 I wanted the bench seat to be about 18 inches deep so I cut it it to be 22 inches because, as you can see in the picture above, about 4 inches are attached to what will be part of the back. Also remember to make the 2 sides of the bench opposites of each other. You want the piece that attaches to 2 legs to be on the inside (see below). The board on top is the first one of the seat and the one on the front covers up the joints. I am going to talk for a minute about screws. I originally didn’t buy wood screws when I bought the lumber because the friends who let me barrow their tools thought they had some. It turned out they were drywall screws. I was dropped off at the house and then everyone left. I was stuck there for the first part of the project without the right screws and no way to get new ones. I went ahead and started because the first screws wouldn’t show in the final project and therefore wouldn’t need to be puttied. But MAN IT SUCKED trying to use those coated screws. 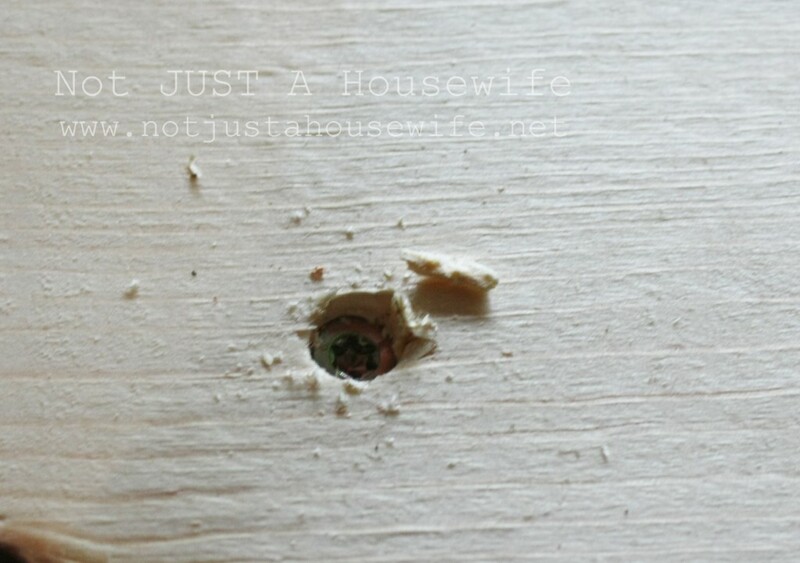 If you have the right screws they will automatically sink into the wood making it easy to fill them over with putty for a finished look. 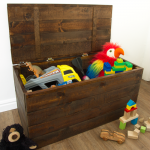 Be careful when using soft wood like pine that you don’t sink them too far. 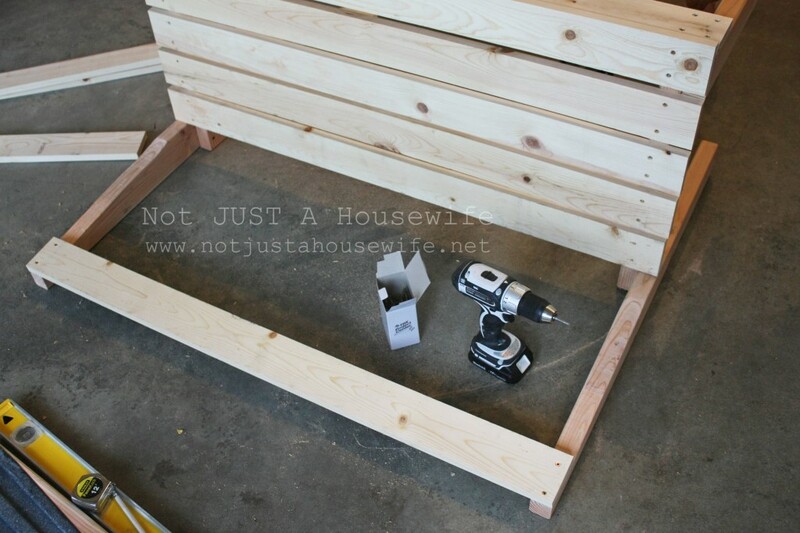 This next step would have been easier had I done it BEFORE assembling the bench. But because I had never made this bench before and I made up the plans, there are always little things along the way that I learn from. 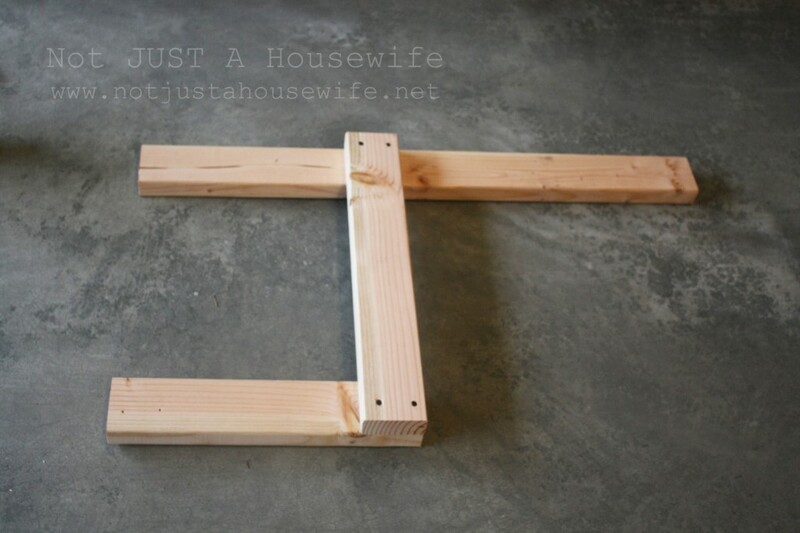 So if you make this, I recommend cutting this at the beginning when you could clamp it to a flat surface. If I would have done it from the beginning I would have measured about 20 inches up from the bottom (to start the line). I wanted the back slanted. I drew the line to be cut and used my jigsaw to cut it. 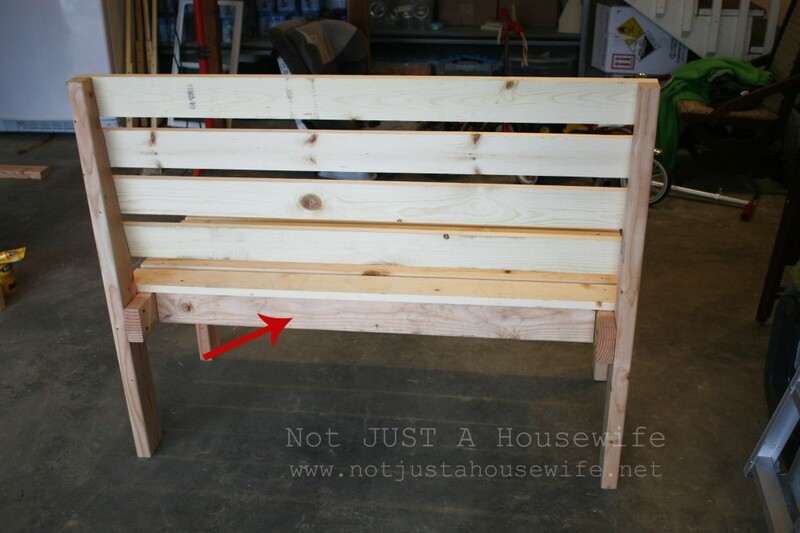 I used the same concept on the back of the bench as I did on the seat. I started with the top one. I made sure it was flush and pretty. Then I screwed on the bottom one. Then I eyeballed the ones in between. Now it was time to add a little support in the center below the seat. It can be argued that it is not needed, but it never hurts to have added support. The first step was to add a board in the back (underneath). 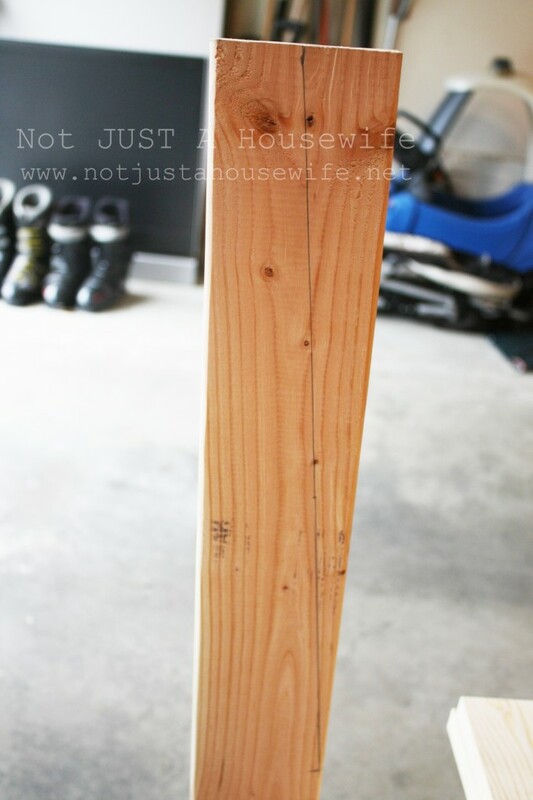 Cut a board that is the width between the two 22 inch boards ( the ones that connected the legs together in the first step). You can see where the board was added in this next picture. 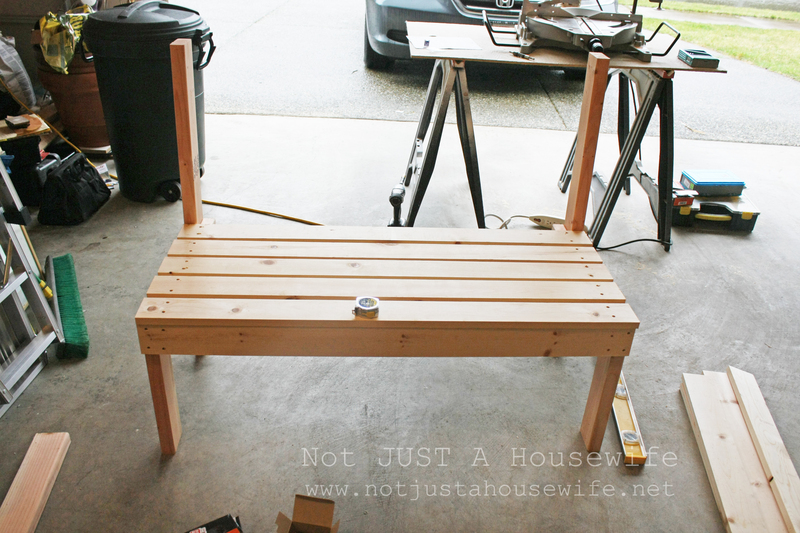 Then I flipped the bench upside down. I cut a board to fit right in the middle. This board is right smack dab in the center of the seat running perpendicular to the boards of the seat. 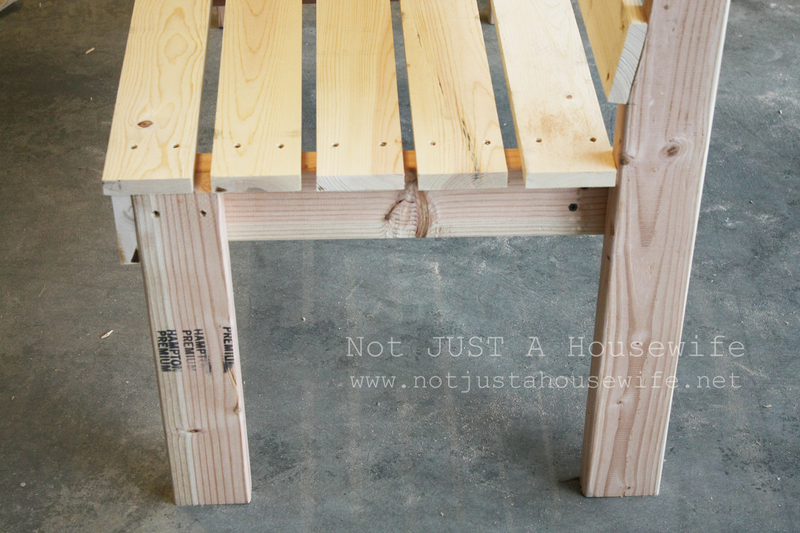 It will prevent the boards from sagging when sat on. You can see in the picture where I screwed it together. 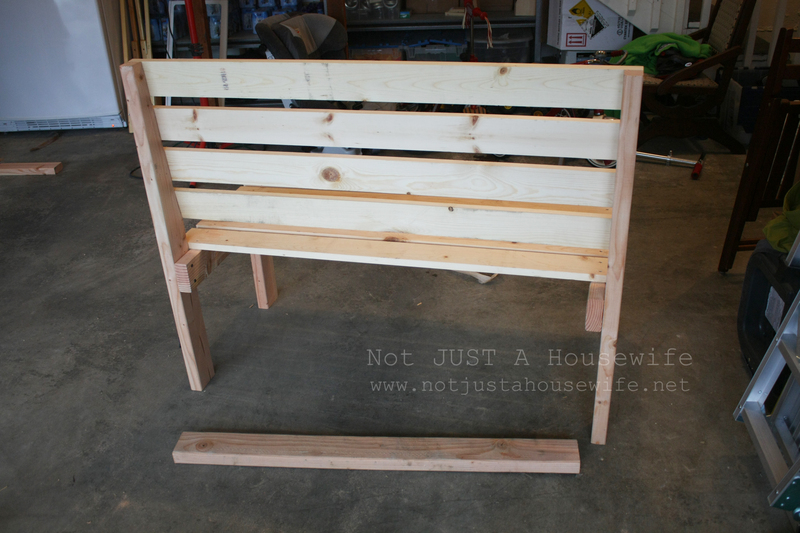 Here is a side shot of the bench so far. If this bench were going outside I probably would not have worried about doing anything else with the side. 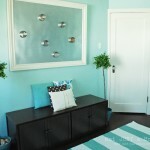 But this was for an entryway and I wanted a more finished look so I added a piece. 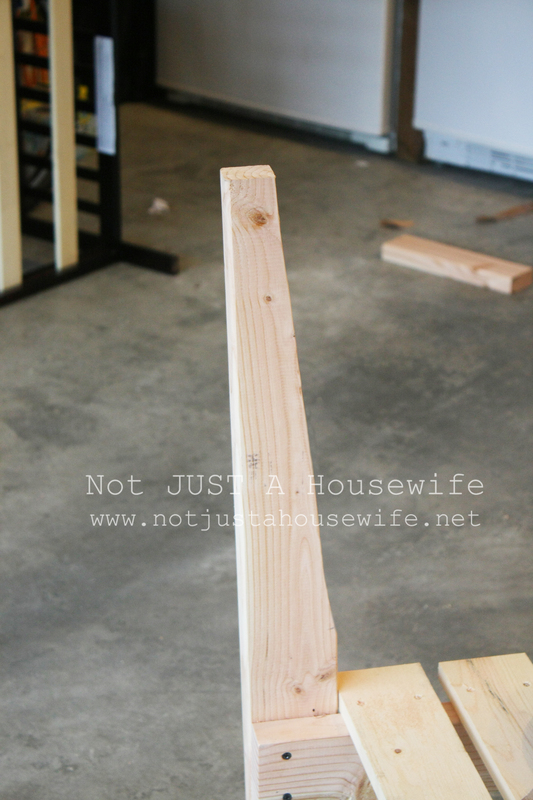 You need to measure in between the two legs and cut a 2×4 that size. I do not have pictures of this next step. I sometimes get caught up in trying to finish and forget to take pictures. So hopefully these arrows help me explain. This is where the 1×3 boards come into play. In order to have a gap between the seat board that is up against the back legs and not have it overhang, you need a 1×3 for the last seat board. 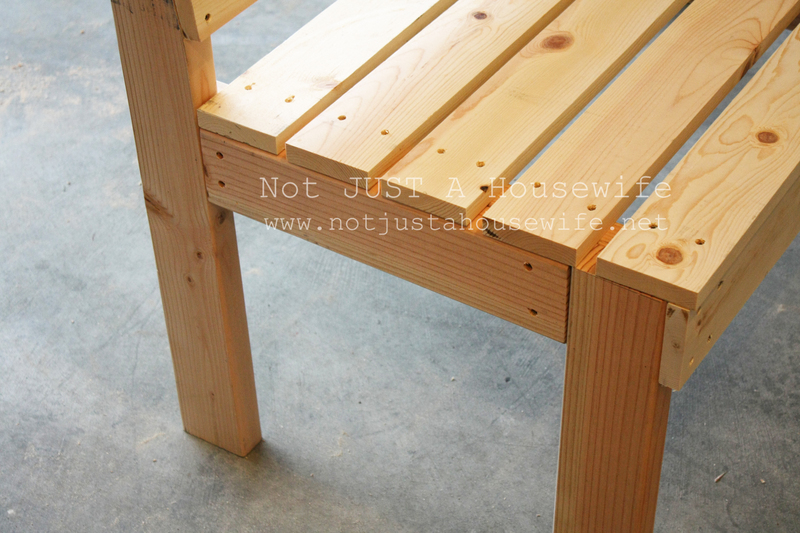 It will also be shorter than the other seat boards since it goes in between the back legs. I also added a 1×3 board to the top to make it look more finished. Here it is all stained! I did two coats of the walnut oil based stain. Super cute bench Stacy! 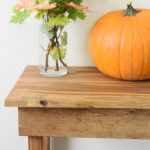 This would make a great bench for a kitchen table too! You are amazing! I love the bench! 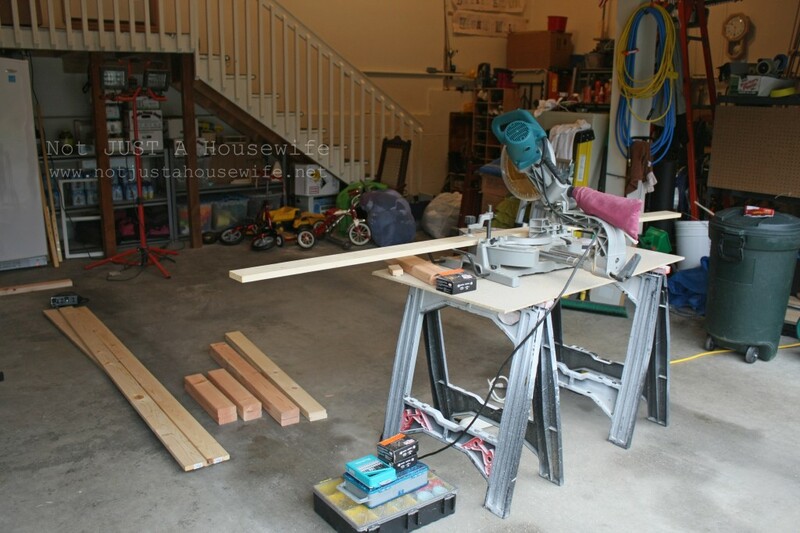 You make me want to take over the power tools and create something as beautiful! Wow, you certainly accomplished a lot while you were there. I bet your sis in law really appreciated it. Beautiful job on the bench. Love the bench! It’s incredible that you come up with these designs on the fly. Thanks for sharing. I bet your sister loved it too. I just gotta know… are you also able to leap tall buildings? Thanks so much for the post! I love that you have an idea in your head and just go for it. One day…. I’ll be brave enough to try that with woodworking, too! You did a great job. Thanks for the post. Looks fabulous! 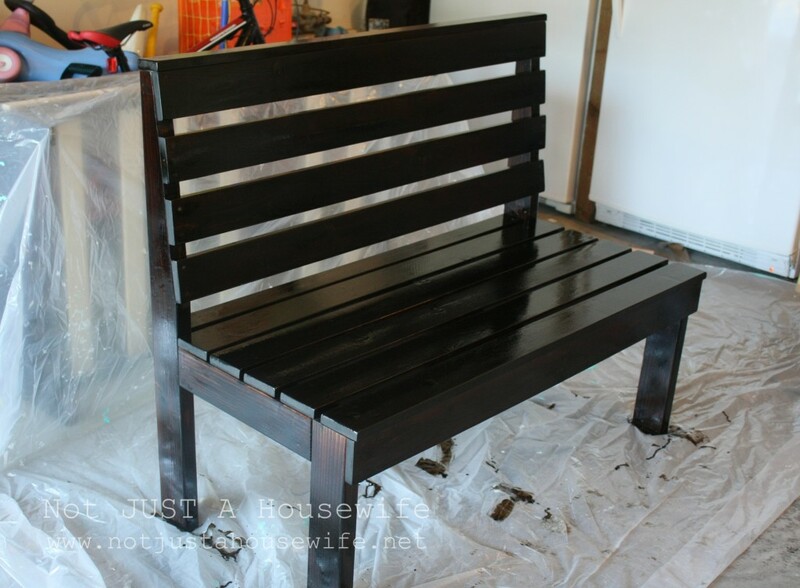 Love the dark stain color and the simple design of the bench. I bet it will look amazing with pillows on it. Omg, that is amazing! I can’t believe you did that just from your head! Well done you! YES! LOVE! And I love that you built this on your own and from scratch! It’s perfect and I love the black. I have to say, whoever has Stacy as a sister-in-law is SOOOO lucky! I love the bench!! And here I totally thought it was a pallet. Looks great! You are so cool. Seriously! This bench is beautiful. Awesome tutorial! 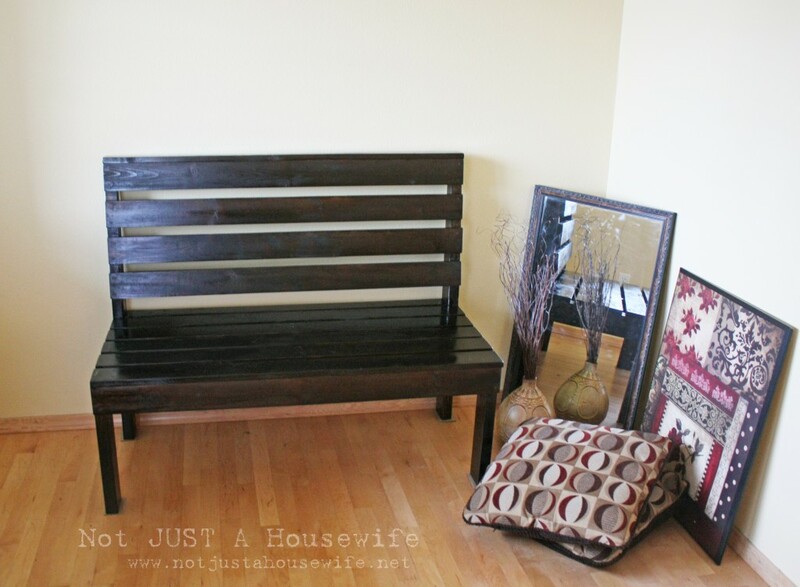 One of my friends just bought a house and wanted to get a bench to put in her entry, but needed a kind of funky size and hasn’t been able to find one. This will be the perfect solution for her, should she dare take up the task of making her own! You are so talented, I wish you lived in my neighborhood and could help me with some of my creative needs! WOW!!! You have some mad skills Stacy. I love your bench. Your tutorial was very nice as well. 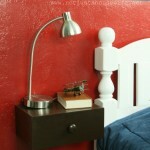 I might have to give this a go (if I can’t find anymore headboards :-) ) Your website is awesome. I’m going to have to follow you now. You’re very inspirational. 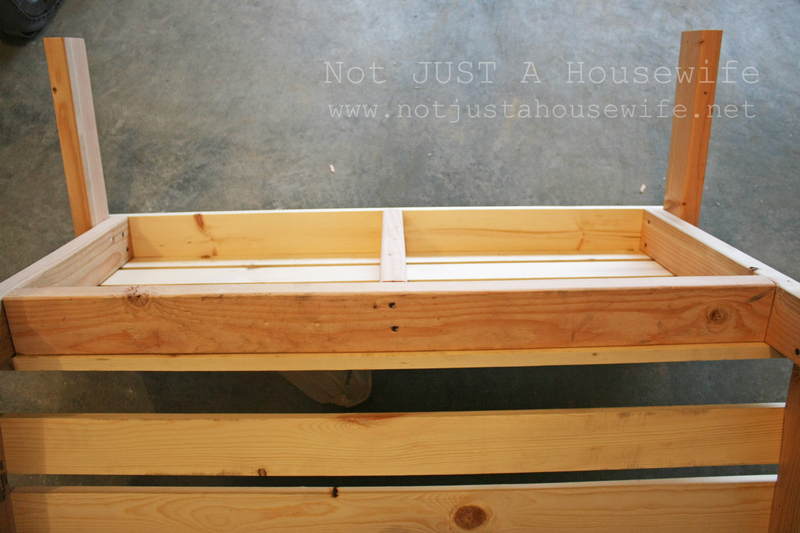 I have been meaning to tell you that I show your fun projects to the Hubs all the time. 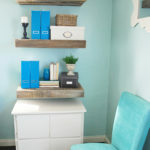 I’m always like, “Look what Friend Stacy built!” He loves to build projects himself, so he can appreciate what you do. He says he is very impressed that you sketch things out and just go. Being an engineer, he draws up his plans to the last detail on his drafting software before he begins. ;) He wanted me to tell you that his favorites are your block lamp, the bench, the shoe cabinet, your bathroom counter, and laundry chute. You should totally pat yourself on the back knowing that you impress the guys as well! If you are interested, please reach out to me at mgreenwald@bluechipww.com. I look forward to working with you!